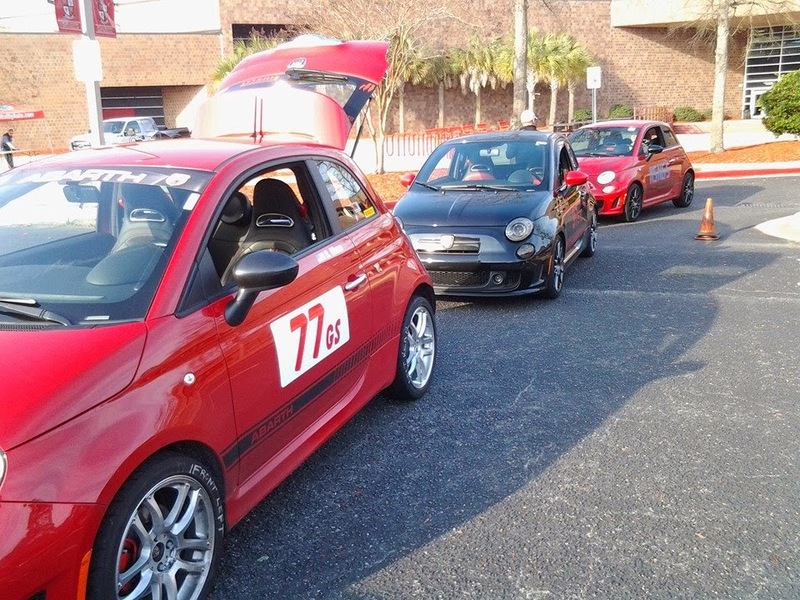 Multiple FIAT Abarths at Autocross! Coming up on Sunday the 17th, the NMS-North FIAT Abarth will return to autoX action with the Tidewater Sports Car Club at Little Creek Naval Base (or Joint Expeditionary Base Little Creek-Fort Story if you want to be accurate, but who wants to try and pronounce JEBLCFS anyways). I thought I'd just show you the normal schedule that the TSCC uses, and point out that it is very similar to other clubs we've driven with that sponsor autocross. I imagine we've competed at events with at least 8 different clubs so far, so it's always interesting to see how various groups run their events too. The NMS-North team (which is made of me) will be heading out about 7:30 Sunday, and then after passing the base security at the gate, will be setting up for driving about 8am. The preparation to turn your daily driver (like my FIAT) into an autocross car means I'll empty all the extra stuff from the car, so out will go the floor mats, gear in the back, and anything in the glove compartment. After that I'll check the tire pressures, stick my car number 77 magnets on the doors, and then go check in with the TSCC crew. Checking in is easy since I'm registered in advance on line, so I'll just sign a waiver form, confirm my car and number, and then walk back to the car. This is probably time to set up my comfy chair under the NMS awning (nice to have shade in the summer! ), and probably pull a water or Gatorade out of the cooler. After that it's time to drive over to the safety Tech Inspection, where other club members will confirm that my car is safe to drive. This involves a quick check that the tires are in good shape (no cord showing), the battery is safely secured, there are no extra items rattling around inside the car, and that my helmet meets the safety requirements. Also, Tech will check that the throttle responds, that the wheels aren't about to fall off, and see that we will have a safe event. Next comes my favorite part of the preparation, getting to walk on the day's driving course. Up to this point I won't know the lay out, so it's important to walk the course a few times to make sure I'll drive the right path, and also start figuring out my strategy for driving. This could be as simple as "Make the Car Go Faster", or I'll start looking at where to brake, where to get on the gas through the various elements, and then later I'll adjust my driving style and try to go faster with each run. As far as I'm concerned, autocross is all about improving my driving skills, and going faster on each run, even if it's only a thousandth (0.001) of a second, since we have electronic timers that measure each run. Then before the driving starts, we have a driver's meeting, and the focus of this pow-wow is to review the rules, with a big emphasis on safety. It takes a village to organize and run these events, and the TSCC does a great job in making sure everyone has a fun and safe day of driving. With over 100 volunteers putting this event on and driving, it's a bit more complicated than a lot of volunteer fun events, but also a lot more fun when it's driving time! OK, that's the basic schedule, so how do I think I'll do this weekend? So far I'm the only car in my GS class, so I'm looking for a top ten there (I still think that is funny, even if you don't), and normally I also joke that I'm trying to be the Fastest Italian car Of the Day (FIOTD). Normally I'm the only Italian car at these events, so you can see now why I'm not a professional stand-up comic! But, extra special news flash here, this Sunday there is another FIAT Abarth signed up to drive! This is very exciting, and gives me some incentive to do my best and have to actually out drive someone to be FIOTD! In the interests of full disclosure, I will report that the other driver is signed up in the Novice class, so you'd expect me to be faster with my couple years of experience, but on the other hand, some Novices beat me anyway, so it should be fun to see how we do with similar cars! The event will take place RAIN OR SHINE. In the event of severe weather, a decision will be made at the driver’s meeting to determine whether or not we will be running. You will be notified by email if the race event is cancelled before its scheduled date.